This unique Ocean Grove vacation home includes two master bedroom suites, one with a full bath and living area and the second as part of the 3rd story vaulted ceiling loft which also includes a sitting room, huge living room, full kitchen, dining area, full wet bar, full bath and a custom designed spacious walk-in custom closet. With the three additional bedrooms, formal dinng room and other living areas, this beautifully designed home easily sleeps 15 adults. 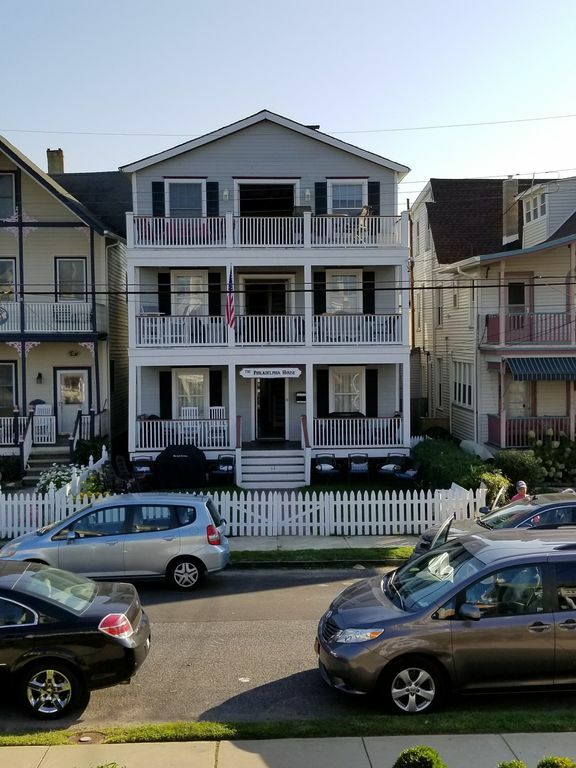 This three story Victorian gem boasts three outstanding porches, each with a full ocean and beach view, open living room, dining room, modern kitchen, full bath and a secluded, fully stocked wet bar on the first floor. The second story includes 3 bedrooms, full bath, laundry room and the master suite with a private balcony overlooking the Atlantic Ocean. A finished lower level provides a media room as an alternate youth entertainment and sleeping area. Whether you are looking for a place for you and your family to stay for a wedding or an event, a family reunion by the beach or simply an intimate weekend away, we will be here to make your stay everything you imagine. We cater to all ages and walks of life. However, while we encourage guests of all ages to stay at the Philadelphia House, only those ages 21 or older are eligible to book our home. Also, we do not book for Prom Parties, ever. We appreciate that this may be disappointing, however, our home is not suitable for such bookings. I have been so fortunate to have raised my family in this wonderful community in this beatiful home. Ocean Grove provides a wonderful family setting with everything one could imagine. As a former Mayor of this community, I am proud of what this community has become and now I invite you to come and experieince for a short time what our family has grown to love over our lifetime. Our home is located on one of the most beuatiful, well kept and friendliest blocks in Ocean Grove. It is just 300 feet to the beach and a 3 minute walk to the downtown business district. I chose our home to raise my wonderful family, pictured above, and they will attest to its special place in their hearts. This home, once a summer hotel with 17 rooms, was converted to a single family home when we purchased the property in 1992. We performed a complete renovation over the next 10 years and recently re-freshened every room. My favorite spaces in our home include each of three porches overlooking the Atlantic Ocean, the eat in family kitchen on the first floor, each of the two master bedroom suites and the third floor manhatten style loft. High speed wireless internet available all year long. (2) Dishwashers located on first and third floors. Large fridge in first floor kitchen. Two bar fridges on third floor. (2) Microwaves located on first and third floors. Big Screen TV in third floor living room with surround sound. Large screen TV's in every bedroom and sitting areas. TV also in first floor kitchen. (2) porches and (1) deck weigh magnificent views of the ocean. (1) deck in rear of the house. While we encourage guests of all ages to stay at the Philadelphia House, only those ages 21 or older are eligible to book our home. Also, we do not book for Prom Parties, ever. We appreciate that this may be disappointing, however, our home is not suitable for such bookings. It's not such a terrible idea! We had a great stay on a cold weekend but there's still fun things to do. The house is great, lots of space and common areas to hang out! The upstairs living room gets great light and was a favorite of the teens on our family get together. Dogs were sooo glad to come along. House very comfortable to stay in. Lovely home. Great for a large group. The Philadelphia House was a perfect place to stay the weekend of my wedding. I had a couple bridesmaids and their husbands stay for the weekend. We were able to get ready on the 3rd floor with amazing views of the ocean. It was a little windy/cold so were not able to use the deck as much as we would have liked, but the space was perfect for what we needed. Communication was good. House was clean and comfortable. I would recommend this house to future guests. Great house - perfect for a large group! The house has plenty of space for a large group, beautiful balconies with ocean views and the 3rd floor living area is ideal for hanging out all together. The owner, John, was readily available by phone when we needed his help getting in. We'd love to go back soon! Thanks for everything! The house was absolutely beautiful and in a beautiful neighborhood. We stayed there for our wedding instead of a hotel and it was the best decision ever. Our photographer took some amazing pictures in the house and outside because it was so beautiful! We absolutely loved the 3rd floor master bedroom, it had a big walk in closet for us to store my bridesmaids dresses and my wedding dress! The balconys were amazing to hang out on and enjoy the beautiful views! I didn't want to leave! All of my guests who stayed at the house said the house was so amazing! We had such a wonderful experience! The owners were so nice and helpful!